Poly Bridge – Games for Android 2018. Poly Bridge – Can you make the perfect bridge? Can you make the perfect bridge? As Android becomes more and more mature, we’re seeing more and more mobile ports of games you’d normally find on PC or console. 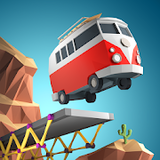 Poly Bridge for Android is one of those games. It first debuted on PC but has since found a great home on both Android and iOS, and a game you’ve probably played in other iterations elsewhere. Poly Bridge is about bridge construction. It’s a physics puzzle game that incorporates loads of mechanics and a fun physics system to present you with scenarios where you’ll have to build a bridge across ravines that are strong enough for certain vehicles to pass over. The type of vehicle will play a role, as will the wind and the length, the materials you use to build the bridge and the length of the bridge. If the game had a free-play mode, it would be easy. Instead, the game forces you into building the most economically efficient bridge possible by forcing you to stay within a set budget. If you can build the bridge at budget, you’ll get three stars for each level. You’re able to go up 50 percent past your budget but it’ll be at the cost of your score. This is great, though, because it allows people to complete the game without trying to min/max the gameplay. It creates a few layers of difficulty without actually making the game more difficult. Some of the controls are hit or miss. Dragging and connecting cables was often a hassle and almost made me not interested in continuing the gameplay. The game itself is really good, however. I feel like if the controls could be hammered down to be a bit more precise, this would be a truly fantastic game.